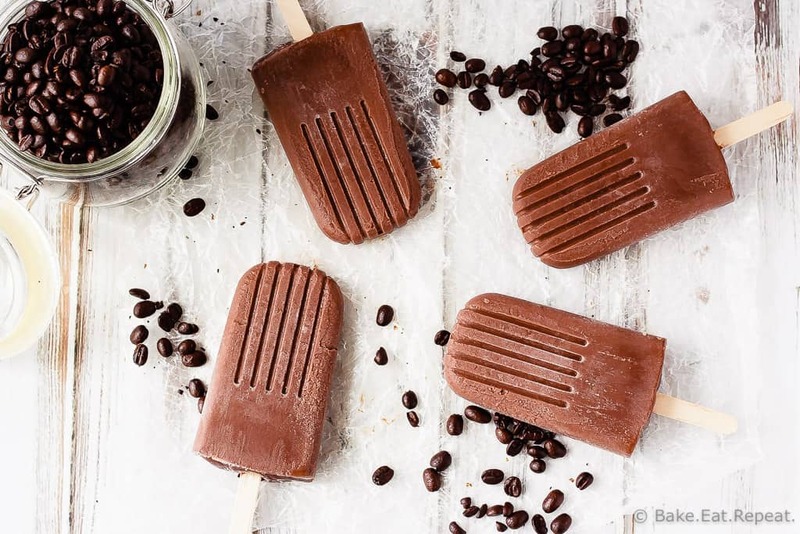 Mocha Fudgsicles Recipe - from Bake.Eat.Repeat. 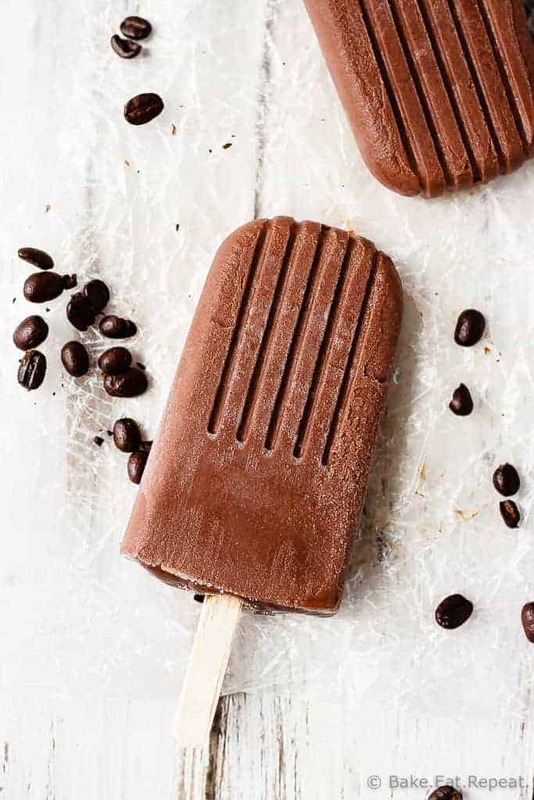 Homemade mocha fudgsicles that are quick and easy to make and are the perfect dessert. Creamy, chocolate-y, fudgy, mocha flavoured fudgsicles. I can’t even believe that I haven’t shared any kind of cold, frozen, summery treat yet. That’s just plain wrong. We are way too far into summer to not have any kind of ice creamy goodness on here yet! I’ll make up for it with these mocha fudgsicles though. So good. Fudgsicles were always my popsicle of choice growing up. Still are if I’m honest. I’ve never really loved a lot of the other options, but there’s something about cold, creamy, frozen chocolate that is just fantastic. Add some coffee and I’m basically in dessert heaven. The bonus? There’s coffee in them so I can honestly tell the kids that they can’t have them. No going to the freezer to grab one and discovering that they have magically disappeared. Especially since my husband doesn’t really like ice cream (I know – crazy!) so they are all mine. I probably shouldn’t make them very often. Coffee and chocolate is maybe the best combination there is – at least in my world. 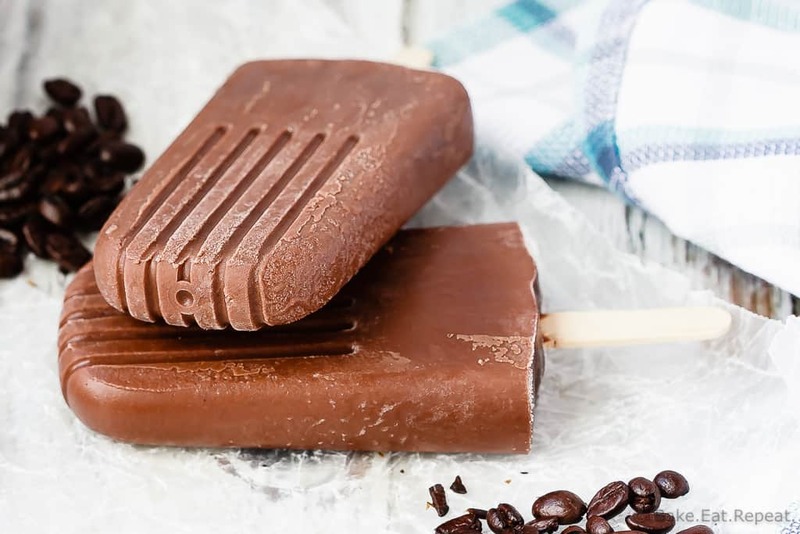 If that’s your world too, you should probably make these mocha fudgsicles soon. Cold, creamy, frozen coffee and chocolate. Is there anything better for these hot summer days? In a medium saucepan, over low heat, melt the chocolate, stirring constantly. Add the sugar, corn starch and cocoa powder and stir to combine. The mixture will be crumbly. Slowly whisk in the milk and coffee, whisking until the mixture is smooth. Increase the heat to medium high and continue to cook, stirring, for 5-10 minutes or until the mixture starts to thicken. Remove it from the heat and stir in the salt, vanilla and butter. Cool slightly and pour the mixture into popsicle molds. Add sticks and freeze until set, at least 6 hours, or overnight. The number of fudgsicles you get will depend on the size of your mold, mine is fairly large and the recipe yielded 4 fudgsicles. Source: Adapted from my Dark Chocolate Cherry Fudgsicle Recipe .